If someone wanted to join the 18th Street Singers, what’s that process like and what are the odds of them getting into the group? The process starts with people signing up on our website. When we have a round of auditions — normally once or twice a year depending on how many current members are moving on — we email everyone who has signed up, encouraging them to pick an audition slot. Generally we call around 100-150 folks in for a 15-minute audition and then a 20-minute call back a week or two later after we have narrowed the list down. The audition is pretty standard: some scales and drills, singing in a quartet, and a solo. Reading music well is a real plus but not a deal killer. For us, there are two things we really struggle with in auditions: first, no matter how much we do to make the process fun and welcoming (and we really do everything we can), the truth is, that for 99.9% of singers, standing up for an audition in front of strangers is scary as hell. The second thing we struggle with is that we have few openings and D.C. has such a wealth talented young folks who want to sing; it is a constant fight between staying an urban-family size and growing to accommodate incredible auditionees. You asked what the odds of getting into the group are, the answer is: it depends on the season. Most of the time, we are looking not just for solid musicians, but for the particular alto-tone or bass-rumble that will balance the section’s sound. In the current group, I think around a third of us got in on our second or third audition, simply because when they auditioned the first time, their voice did not fill the particular needs we had at the moment. So here is my pitch to folks thinking about auditioning: Sign up; don’t be nervous, we are not judging you, we are just listening for how your particular voice will fit in with the group; and don’t be deterred if there are no openings on your voice part this time around. If someone loves to sing, there are numerous outlets throughout a city for them to channel those energies. What makes the 18th Street Singers such a special group to be a part of? There are two things that I think make us unique and delightful: The first is that we are a smaller group of incredibly talented younger folks. There is this idea we kick around from time to time, of being an urban family. It is the sort of thing you can laugh about, but at the same time, to make really great music you have to trust your fellow singers and be willing to be emotional and vulnerable with them on stage. I think we would not be able to achieve what we do, if we didn’t have progressive parties, weekly happy hours, extra-choir trips, music-learning retreats, etc. The other thing I love about us is this ethos: we are all volunteer and we don’t collect dues. Everyone, from our singers to our conductor to our web designer to our managing director are there and working towards this goal because they want to be. This drives so many of our decisions, such as a constantly changing repertoire, new concert venues and engagements, and encouraging community outreach. How would you describe the average 18th Street Singer? What types of personalities comprise this group of talented vocalists and how have you been able to synthesize those voices into one comprehensive group? First I have to give a tip-of-the-hat to our musical director, Benjamin Olinsky, who has really been the mastermind behind finding and merging great voices into a powerful ensemble. Demographically we are a young professional group: the average 18th Street Singer is between 22 and 34, is working in D.C. as a teacher, hill staffer, lawyer, non-profit coordinator, Navy Sea Chanter, researcher, accountant, or programmer. Once you’re in the group, what’s it actually like? Do you perform a lot throughout the year or only a few special events in any given season? We run in two seasons with a summer break in between. While the most significant performances for us are our fall and spring concerts, we try to mix in other performances or events around once a month. A great example of this from last year was a joint concert we sang at the Shakespeare Theater with a group from Switzerland. After the concert the Swiss Ambassador invited both choirs to his home. After some food (and drink) we overcame the language barrier and found songs both choirs knew, continuing to sing late into the night. That was an extraordinary moment. 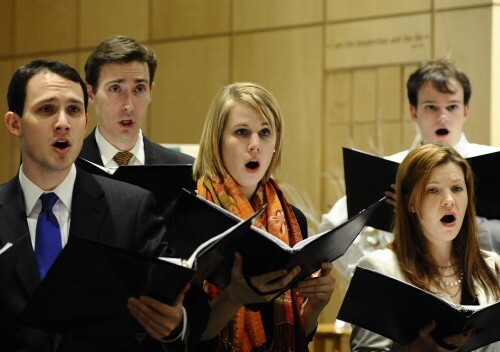 Other mid-season events include things like singing at the Strathmore Mansion, at the National Gallery of Art, going on retreat, singing at the Piccolo Spoleto music festival, and performing at the National Cathedral. One year, while I was away, the group sang at the White House for the national Christmas tree lighting. On a more day-to-day level, we rehearse every Monday night and usually have a happy hour on Friday, mixed in with other random events organized by our social chairs and members. When selecting the group’s performance repertoire, what is your thought process and why? One of our core goals as a group is to make music accessible to people; to share this love we have with friends, family, and the broader community. Before each season our musical director lays out a concept or theme for a program and invites suggestions from the group. He hosts listening sessions where interested members can come and play through suggestions or workshop arrangements, if we are doing something original. Ultimately, our director chooses a collection of songs and the season kicks off. Personally, I like his approach of building music around a theme, since it gives us and the audience a context for the music. Past themes have included songs of war and peace, American music through the generations, and folk music from around the world. Our concert this Friday and Saturday is built around music conceived for the cathedral. What’s on tap for 2014? Anything exciting to tell us about? Yes! First we have a concert this coming Friday (January 24) and Saturday (January 25) that you should come to! Tickets can be reserved online. If you have to miss that, for the spring we are planing on delving into the work of living composers including (fingers crossed) debuting several new compositions at a concert in June. Right around the corner, on Saturday, March 8, we plan to host a joint concert with the Young New Yorkers Chorus at the Church of the Ascension and St Agnes. I think this will be really fun event as they, like us, are young people devoted to making music accessible to the next generation. Finally we will be looking to welcome a few new folks into our ranks so if you know any great low basses, encourage them to check us out.